Please click on the titles below to expand each F.A.Q. Google does not provide a total amount of reviews as part of the information about your Google Place. So how do we deal with providing you with the right information? We make an effort to take this information from external sources but this process sometimes is error prone. Once we collect your reviews total number we try to store it and we only update it again if we are sure the new information is correct. In the unfortunate case your reviews total is not up to date or very different please notice that our system will try again to fetch it again in 1 hour. This is the best MyReviews can do given that Google has incorrect/missing information on its side. If you want to see further information about this here is a feature request for the total amount of reviews to be added in the Google Places information. As you can see this is an issue on Google that has been ongoing since Jul 17, 2011 so we do not expect this to be fixed any time soon despite Google having assigned an engineer to fix the problem in Jul 31, 2012 . Please subscribe our newsletter to receive updates on bugs and features for MyReviews. I have new reviews but they are not appearing on MyReviews yet. Do I need to update it? Although the reviews do not update straight away they are pulled in regularly. You do not need to check the setup as it is all done automatically. We implement a caching layer that lasts between 1 to 7 days depending on the source of reviews. This allows the app to serve the reviews faster for all users of your website and not break T&Cs with Google, Facebook, Yelp. If we did not have this in place your website performance would be affected as well as your user experience. Google will show most helpful first, up to 5 reviews. Yelp uses its own ordering, so it is not predictable, up to 3 reviews. If you still see outdated reviews after 7 days please contact us with your site and pages details. How to find my Google Place? We have made it easier to find your Google Place, so here are the different options on how to set it up on MyReviews. Still unable to find your place? contact us anytime. 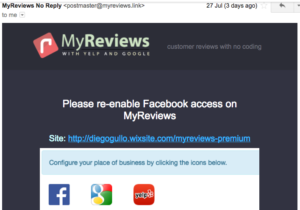 Can i select and modify the reviews being displayed on MyReviews? 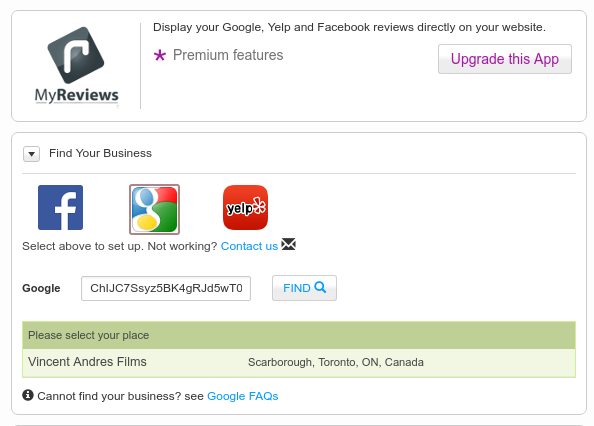 We have seen a lot of interest in users asking to modify or select some of the reviews being displayed. In some cases a negative review or selecting specific reviews to be feature might be preferable. However, at the moment, our app objective is to display unbiased and sincere reviews and ratings listings without modifying the displaying ordering or hiding/featuring or specific reviews. The main reason behind is given by the terms and conditions of usage of the third party reviews sources. We are always considering changing this based on the review of terms and conditions from Yelp, Google and Facebook. Currently there is no planned date for a change in the above displaying logic. If you would like to be kept updated about our new features please follow/like us on Facebook. Also if you would like to know more about how reviews are displayed see this FAQ. Why I cannot find my business on the MyReviews Google business search? You need to have a business registered/claimed on Google to start collecting your reviews and show your information to customers. Please visit the Google My Business page. I have registered/verified my Google Business but it is still not being returned in the MyReviews search. Google constraints exposing some of their business listing information if the business is not "verified". Google does a fairly strict check, i.e. by post, to verify the business address. Please make sure your business is verified or our application will not be able to see your business in the results. To verify your business please check these instructions . 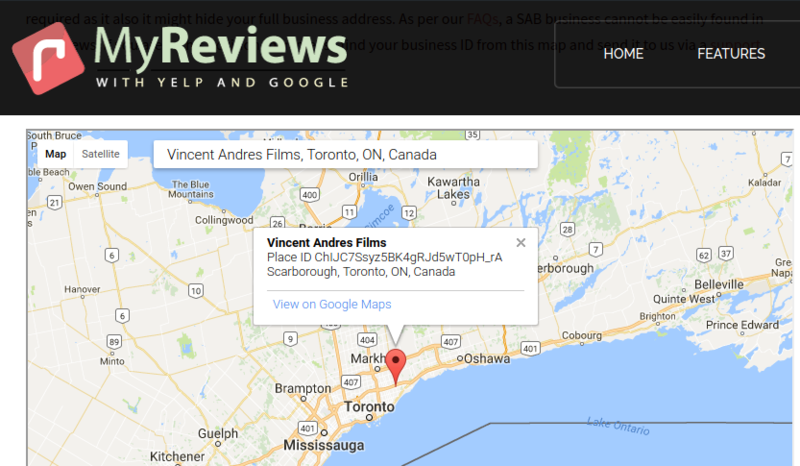 If your business is set up as a Service Area Business (SAB), you will not find it by name but you can find your Google Place ID and use it within MyReviews search on Wix. Sometimes it is very difficult to find a business unless the information above is provided and it is correct. You can always contact us for support if you are still unable to find your business using the method above. Even if a business exists on Yelp, it needs to have at least a review before it will be returned in the results search. Although you might have a business registered, it still needs reviews before our applications can display them. If you have reviews on Google or Yelp please contact us to help you with troubleshooting. If you are not happy with our application please consider contacting us to help you with information and troubleshooting. However if you are sure you would a a refund please access your Wix panel app subscriptions as all billing aspects for our Wix application are handled directly by Wix.